Battlefleet Engineer: Introducing Battlefleet Engineer! Hi! I'm Tomi, the developer of the modular spaceship building, fleet management and combat game called Battlefleet Engineer. I have been working on this on-and-off for about 2 years, with the overall pace slowly but steadily increasing. In Battlefleet Engineer you will be able to design modular spaceships from small fighters with 10 modules to capital ships with 500+, fight against computer controller opponents and fleets of similar ships, upgrade your ships and build up a fleet to take on pirates, mercenaries, corporate factions and even the armadas of interstellar empires as you please, and much more. To get an idea about current state of the game, and its core technical features, please check out the following video. Modular, freeform spaceship design where every aspect of the ship is defined by the modules and nothing else. You are not just adding upgrades to a pre-defined hull, the modules are the ship! 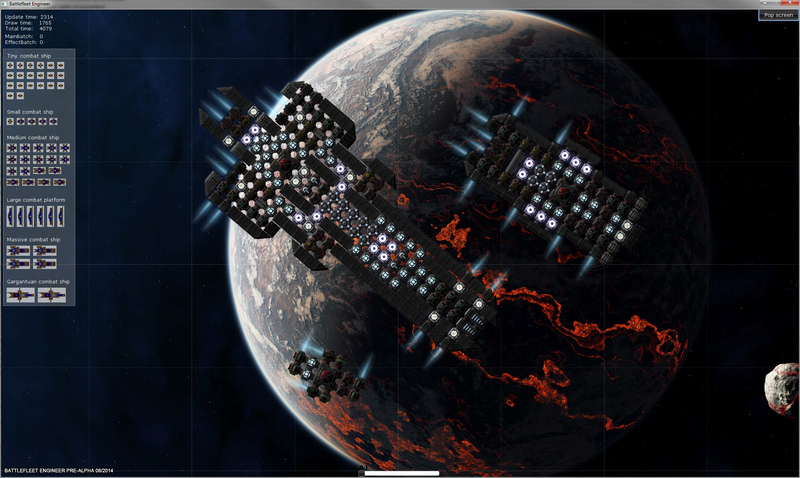 Each module has mass, contributes resources, can add constrainst to the design, may get disabled or destroyed and so on. No-cheating Newtonian physics driven gameplay. Nearly all space games simplify space flight by including magical engines that can accelerate the ship in any direction and adding phantom forces or friction to simplify control. Battlefleet Engineer will have none of that, because I strongly believe that a more realistic approach will ultimately yield much more engaging gameplay and vastly deepen the ship design aspect of the game. Your design choices will affect everything. The ship designs you choose or create will directly affect the viable strategies you have available in battles, as well in the bigger picture. Capital ships may be able to deal and take massive amounts of damage, but can't chase down targets, and a a squad of specialized fighters may be able to flank and disable them with ease. To success, your favorite combat strategies will need to be reflected down back to the ship designs and fleet composition. Shooter or RTS, your choice. 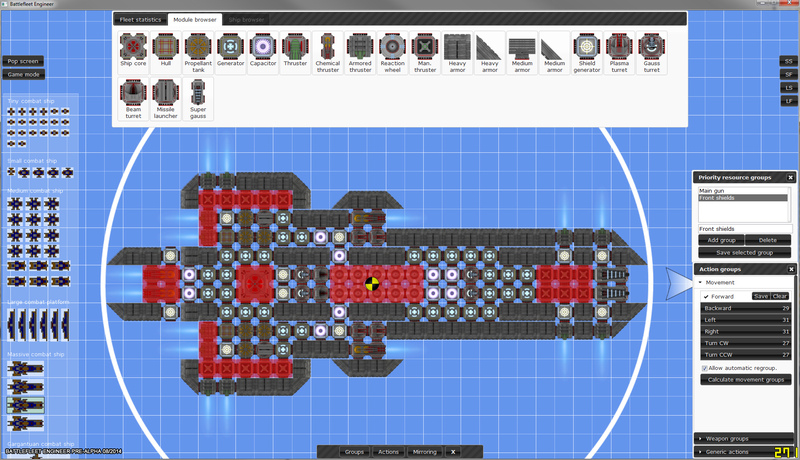 Build, upgrade and fly a single powerful ship yourself or construct, maintain and command a fleet of smaller ships. You can seamlessly take full or partial command of any ship in your fleet during combat. Simulation that is not just skin-deep. The game will feature real-time simulation of resource generation, storage and consumption (electricity, fuel, ammunition, waste heat etc.) within the ships, and a per-module damage system with modifiers for different types of threats (kinetic, plasma, charged particles, radiation). The actual properties of your ships will also affect the bigger picture such as "campaign map" movement speed. Logical encounters. Space is unbeliveably vast and there are no borders to be seen, so why limit the battles to relatively tiny arenas that you cannot escape? If you have a faster accelerating ship than your opponents and decide to flee an encounter, the game will let you do so. On the other hand, you will need to design your fleet for great peak acceleration (and maybe suffer from it in the battles) if you want to hunt down other fleets. These are the main design goals for the final, released game. Note that the game is currently still in a very early stage of development, and only some of the core technologies have been implemented. Build spaceships from 5 to 500+ modules in size from a library of about 40-50 different modules. Many of the modules will be unique in function, while some will have two or three variants such as: a point-defence capable small laser beam turret, normal offensive medium laser, and a large heavy laser for capital ships. Command a fleet with RTS style controls or fly ships yourself in intense, brutal space battles where ships get torn apart, and clouds of shrapnel and destroyed hulls continue to expand afterwards. Enjoy the beauty of energy weapons going off with dynamically lit surfaces reflecting the light, see each hit and collision in slow motion, or speed up the mop-up of a crushed enemy fleet. Variety of weapons: Traditional kinetic cannons, plasma launchers, beam weapons, dumb and smart missiles with variety of payloads, intelligent mines etc. Modules will have different levels of resistance against each damage type creating a rock-paper-scrissors type relationship. For example, shields may be very effective against charged particles and radiation, but have nearly zero effect on purely kinetic projectiles, while traditional armor can resist physical hits, but may be pierced by a high-energy beam. Sandbox and progressive game modes. Engineer and do battle with the absolutely finest fleets in sandbox mode, or start small and unlock modules, gather resources from fallen enemies and get stronger after each successful battle (or get annihilated when you pissed off the wrong guys) in survival and campaign modes. Simple additional game modes, such as racing, are also likely to be included. Up to this point the development has been relatively slow, only me working on the project on my free time from university studies, averaging just few hours a week. However, I now have an opportunity to dedicate myself practically full-time to the project for next 6 months starting on September. During this time I will concentrate on implementing a working, playable early-access stage of the game. After the six months I will have two choices: either get funding to continue full-time development via early-access sales or start working on my master's degree thesis, forcing the game development back to a very limited part-time role. Preliminary target features of this early-access stage are as follows. Fully featured combined ship and fleet editor (already the core features for this have been implemented) with a limited available module set of about 20-25. Arena-based combat with any player-defined fleets, one being controlled by computer AI. Ship and fleet level combat AI. Weapon modules implementation: Gauss, Plasma, Laser beam. Survival game mode with simple progression mechanics. 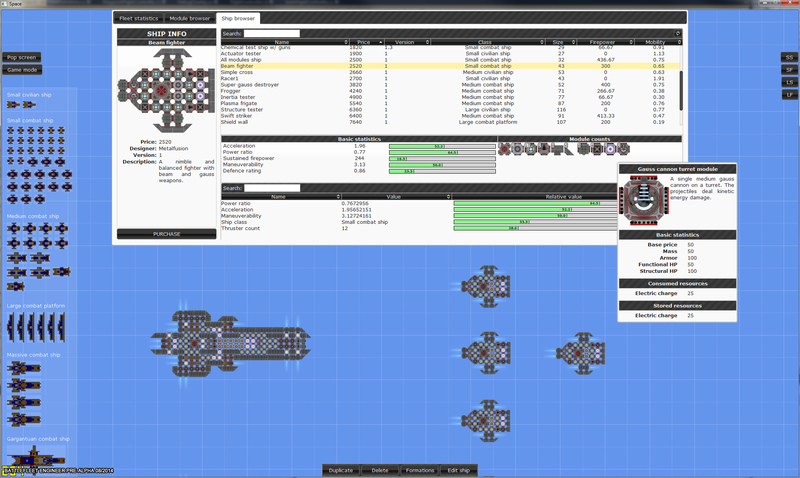 Sandbox game mode, where the player can spawn ships for both sides during combat. Full or partial rework of all graphical assets by a real artist. Includes the UI and module set. I plan on writing a more technical overview post later this month, and during the 6-month full-time development period there will be updates each month about new features and general progress. The monthly updates may be accompanied by short videos as well as screenshots. You are welcome express your questions and wishes about interesting topics to cover in the comments, stay tuned!